This spring I had the pleasure of participating in a supper club; you know, the practice that's currently so popular of getting together with friends to cook and enjoy a special meal. 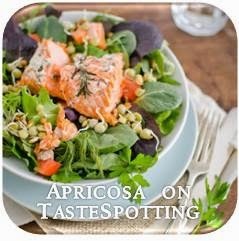 Meeting Tuesdays on a monthly basis, we'd coordinate by email who would be bringing what dish, do some cooking at home, if necessary, and then do final prep work at the hostess's home, enjoying a glass of wine as we caught up with each other after a work day. My club decided to go on a tour of the Mediterranean together. We started in Italy, feasting on a homemade ravioli and whole grilled fish. "Traveling" through France, we nibbled on ahi tartare on toasted flatbread with bleu cheese and red wine reduction, navarin d'agneau, and vacherin with strawberries and rhubarb cream. The next month followed with fish in romesco sauce with parsley potatoes in Spain. Unfortunately , complications arose as we tried to cross the Gibraltar, and we didn't quite make it into Morocco. However, these tasty meat pies known as b'stillas made it! (I had assembled them and popped them into the freezer a couple days ahead of time, before I learned we had to cancel club.) That was a while ago...and my club hasn't resumed our journey together. So, I decided to clear out some freezer space and enjoy these great pies at home! 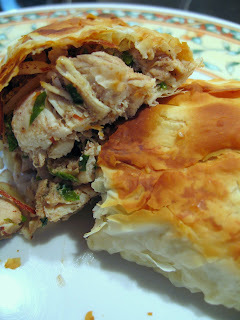 Even after weeks in the freezer, the chicken filling turned out moist and juicy, redolent of saffron and cinnamon, and the phyllo pastry baked up perfectly flaky and crisp. As this was the first time I ever ventured into Moroccan cooking, I looked for a well-reviewed recipe rather than make something up on my own. I found this recipe for individual Chicken and Almond B'stillas in a past issue of Gourmet Magazine, though I reduced the number of eggs to 2 and doubled the amount of ras el hanout. I also omitted the cinnamon sugar topping, but after tasting the final product, I think I would include it next time. I can just imagine how slightly melted cinnamon sugar clinging to the tops of those crispy meat pies would be a treat for the mouth! Supper club friends, will we ever meet again? This is one of my all-time favorite dishes! I always order it when I go out b/c I imagine it taking so long to make at home, but this makes me want to give it a try!